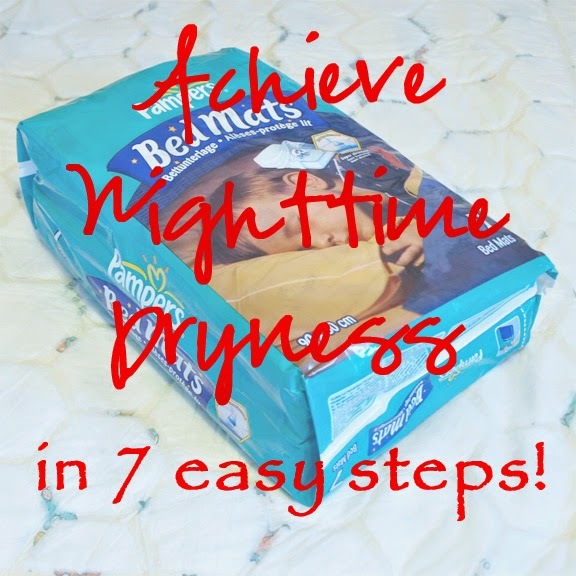 How to achieve Night Time Dryness! Are you tackling potty training with your little one, but haven’t quite conjured up the energy to conquer night time dryness? Or are you fed up with changing your child’s sheets in the middle of the night? Sprout’s potty training journey began in August 2012 when I tried to potty train her over the summer holidays. It soon became clear from the numerous puddles around the house that she simply wasn’t ready for this step! Her second attempt took place towards the end of October just as we had moved house and were about to get married. Luckily, it turned out to be fairly painless. We didn’t tackle nighttime dryness until mid-August 2013 and I think it took us about 3 or 4 weeks to crack, however compared to daytime potty training it proved to be fairly painful!! So I have compiled 7 simple steps for you to follow in the hope that you have an easier time that we did!! 1. Invest in a really good waterproof mattress protector!! The last thing you want to be doing is trying to dry out a urine soaked mattress in the middle of the night! We bought a cot bed mattress protector from Little Green Sheep. It is made from layers of super soft organic cotton between which there is a layer of food grade polyurethane. The sheet is flat rather than fitted to encourage breathability and help create a barrier against dust mites. This also means that you can position the protector wherever you need to! Sprout has used hers ever she started sleeping in her cot and now uses it on her full sized single bed. Neither her cot bed mattress nor her single bed mattress have any marks or stains on them! 2. 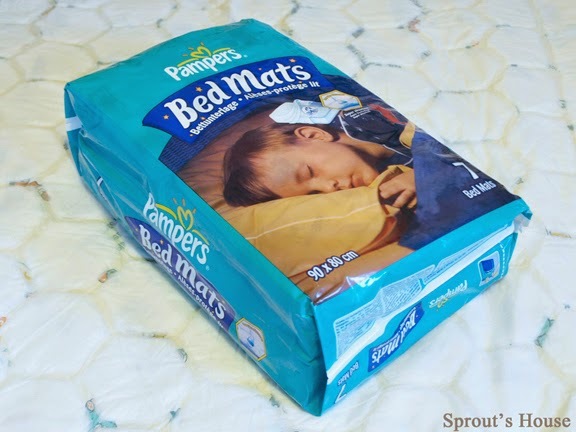 Buy a couple of packets of these Pampers Bed Mats. These are literally worth their weight in gold as they help cut down the amount of laundry you have to do. As a working Mummy, I found it hard to keep up with washing all the sheets especially ensuring that the mattress protector was dry and ready for the following night. We started off by laying one of these sheets across the top of Sprout’s bed sheet so that if she had an accident it would just be a case of changing her pjs and possibly the duvet cover. 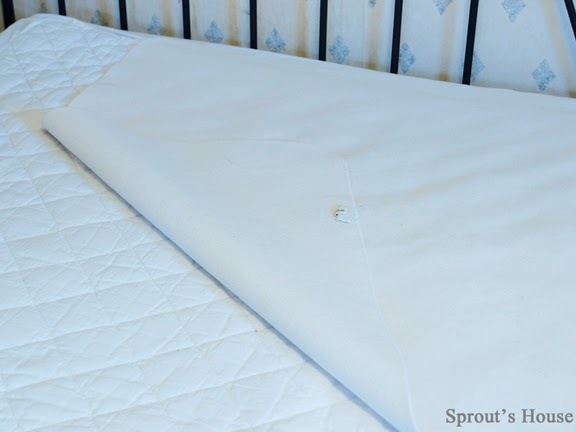 The only thing about the Pampers Bed Mats is that they are a bit ‘plasticky’ so as Sprout began to have more dry nights we moved the pampers sheet to underneath her bed sheet and since then have just removed it altogether! 3. One of the most important things you can do is give your little one the chance to empty their bladder by hopping on the potty or loo just before you tuck them in and say goodnight. 4. Even more important is to give them the opportunity to wee just before YOU go to bed! This will give them a great chance of remaining dry through the entire night! Sprout has been dry over night for about 8 months and we still pop her on the potty each night as we make our way to bed. Generally, she snoozes right through this night time wee and we usually have her potty right next to her bed so it doesn’t tend to disturb her too much. 5. We also leave the potty in the same place in her room each night so that she can use it if she needs to. 6. Leave out spare pyjamas, bed sheets, duvet covers and even towels just in case you need them for those middle of the night changes! The last thing you want to be doing is riffling through your cupboards at ‘silly’ o’clock in the morning. 7. If you find that your child is continually wetting the bed in the night then it might be worth limiting the amount they drink after 4 or 5pm so that their bladder is not too full. One of my friends has recently used these tips to help her daughter stay dry through the night and has reported back that it only took them a week achieve night time dryness!! Have you got any night time dryness tips? Pop your ideas in the comments section!